In the last post I talked about mini-schedues for routine tasks with a few examples. 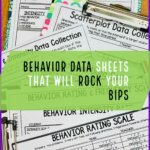 Today I want to talk more about the examples to give you an idea of how these types of schedules can be used effectively for different aged students. Yesterday I talked a bit about using visuals for washing hands and for the arrival routine with the pictures below. Here are some other schedules that I thought were interesting and might give you some ideas. 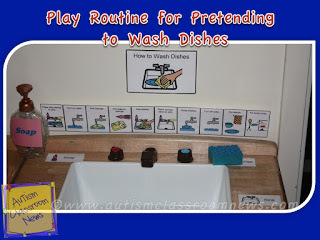 This one presents a schedule for a pretend play activity of washing dishes in the kitchen. There is a corresponding one in the play area for cooking food. 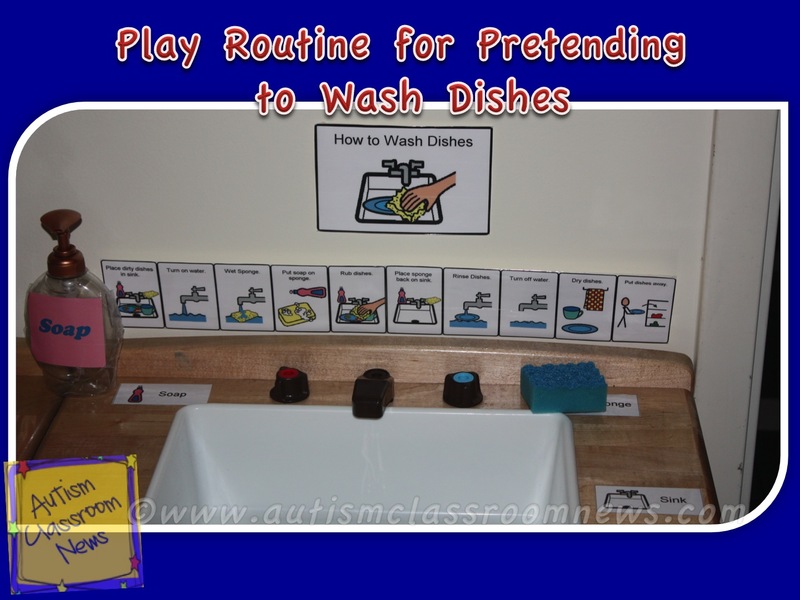 This is in a preschool with autism and students with autism often have difficulty understanding pretend play. The schedules give them cues about how to play in the area like the other students without an adult having to be right there to tell them what to do. I talked a bit about C on the left in my last post. It’s a bathroom pass used for a student who we were trying to teach to be more independent in the bathroom. We wanted a way for her to carry her own visuals with her since we had difficulty keeping them up in the bathroom and it would build a life skill for her in the future. 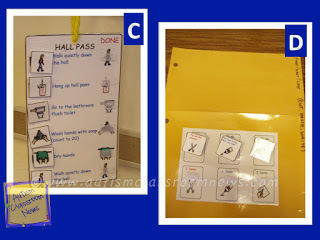 She was independent with the tasks in the bathroom but needed some cues to complete the entire sequence of steps. She picked up the pass and walked to the bathroom and it became her mini schedule. On the right (D), this was for a student who needed cues within her structured work system to complete individual tasks. So the teacher put cut, blue, write visuals on the inside of the folder that held the worksheet she needed to do. 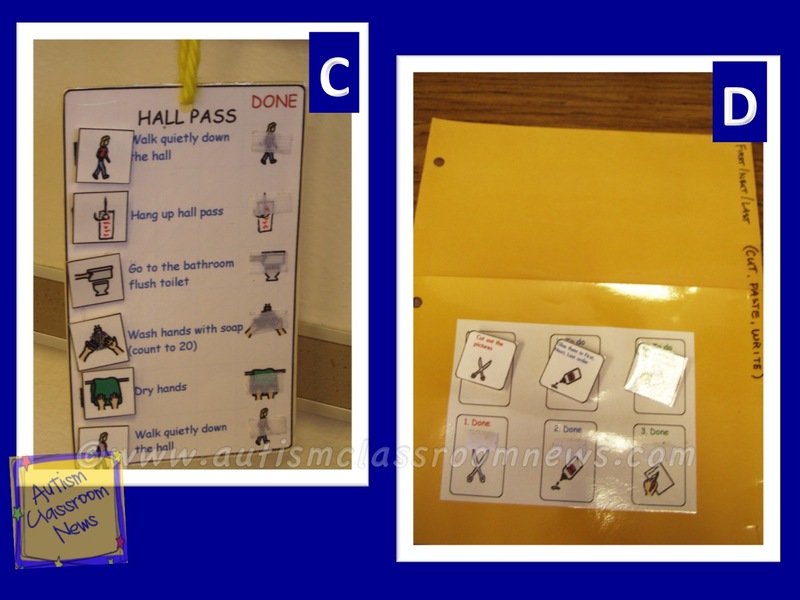 This allowed her to follow the steps, move the visual for each step to the bottom when she finished it, and be independent at completing each of the steps of the task. 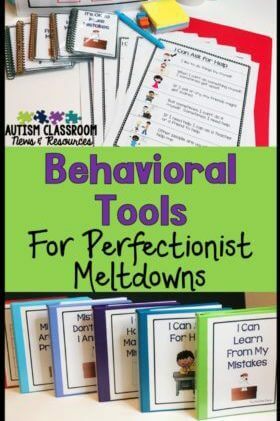 This was useful because she had difficulty understanding the written directions on the worksheet and also she tended to stall out in the middle of a task because she wasn’t sure what to do next. So the teacher would see her sitting at her desk with her work in front of her but not finishing it and have to prompt her. With the schedule, she didn’t need the extra prompts. Finally, this example (E) is a fairly recent one. 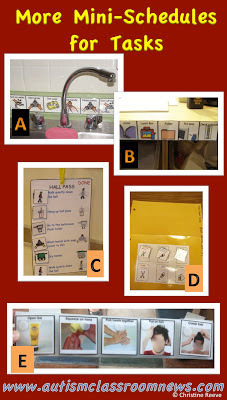 One of my colleagues is working with an organization implementing visual supports in residential living situations. As part of that she had developed visual schedules for washing hands, showering, and brushing teeth. 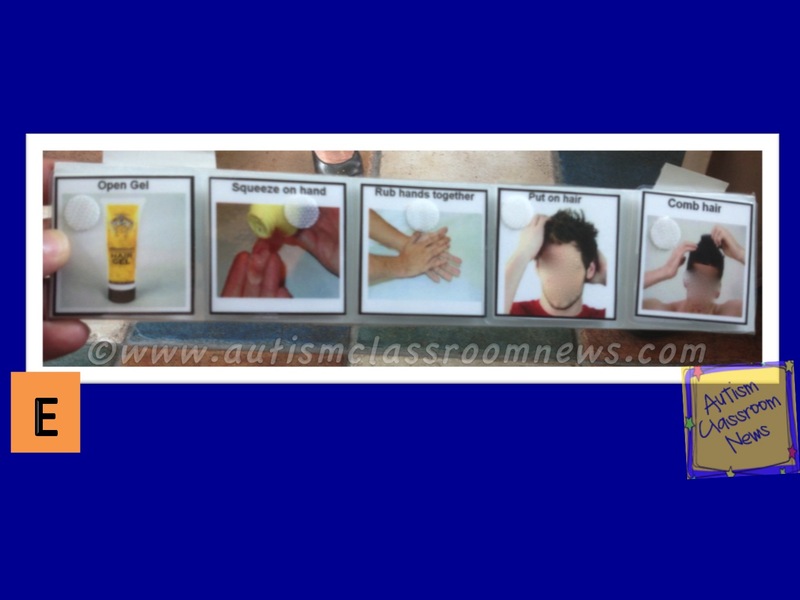 While she was demonstrating for the staff how to use the visual supports to teach the skills, one of the teenagers asked if he could have a visual sequence for putting gel product in his hair. So, of course she had to make him one! I got to implement it with him and he loved it! He was so cute–he couldn’t decide how to comb his hair once he got the gel in it. And he was completely independent with it. One of the things I didn’t mention in the last post that is worth considering. 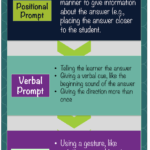 If you have a student who isn’t completing a task independently and doesn’t want to engage with the task, even with the visuals, consider putting a fun activity at the end of the strip of visuals. This would be similar to a structured work system, but also lets the individual know what he can earn for completing the task. That incentive may allow him to complete the task on his own. 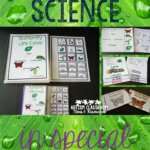 So as you can see, there are lots of different ways and times to use visuals for teaching a variety of sequences of tasks. In my next post, I will talk about scheduling out activities within an activity–like setting up a mini-schedule for the activities of reading. Anyone have any great examples of unusual ways you have used schedules? 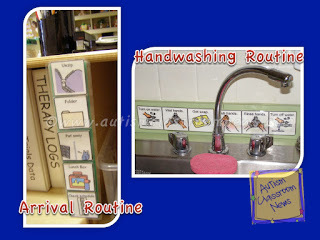 And if you want to download, this site has a free download of a washing hands sequence. These are great!! We use "mini schedules" throughout our classroom too. We call them task analysis, but its the same thing. 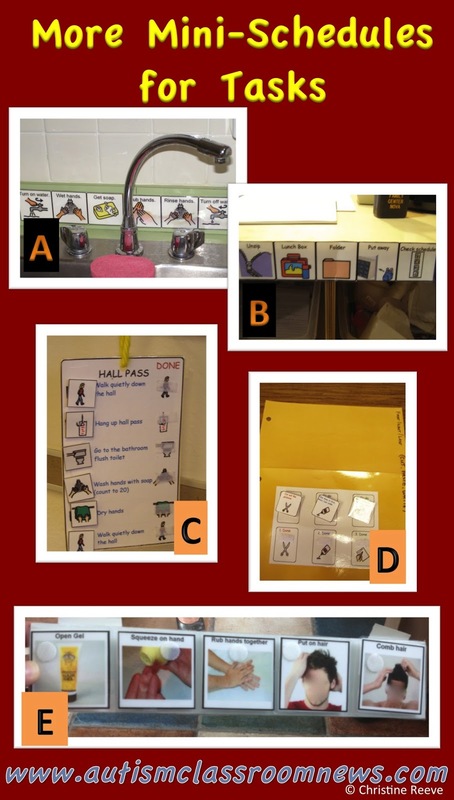 I find it extremely helpful with our kids to eliminate verbal prompting and rely on pointing to the pictures. Our kids heavily depend on visual prompts. Love all if the visual schedule options! Especially the one to teach play! Thank you!